Ask her for an appointment and you have to factor in the possibility that she could be bringing a cat down from a roof, organising rescue at a collapsed building or shouting orders to her crew to position the hose at the fire. A typical day at office is far from typical for Meenakshi Vijayakumar, the first woman divisional fire officer in Tamil Nadu. Any calamity in North Chennai, she is one of the first few people to know. Male bastion, ma'am. That's just by the way. It's more of, "I needed to reach out to people, like Oprah Winfrey or desi Kiran Bedi." Reach out she did, before you could say "Conflagration, Assistance! (Fire! Help!)" on 21 major calls, the two years she has been in command. "Hollywoodian" is how she describes her work that takes her to towering and ground level infernos. Saving lives gives her a high. The how and the why ma'am. "Stand on your own" topped her stern, ex-director, Children's Hospital mom's list of instructions, followed by "Don't depend on anyone". She did M.A. (Literature) at Ethiraj, completed a course in Industrial Management, got married, moved to Delhi, taught in a college for a while, led a "normal" life. But "normal" gave way to monotony and she found herself muttering, "This is not you, Meenakshi." It was time for rule three — "Be different, do something for society." She added a fourth: "Go out and take life head on." I have to work, she announced to her airlines officer hubby. Wisely he nodded, knowing she would have gone anyway. Back in Chennai, she took the TNPSC exam, joined the list of the 200 who survived the prelim, main and interview and waited four years for the call. She had picked the fire services... " Theirs is the coolest uniform! And Kiran Bedi's commandment went: "When you work in a uniformed service, you get power, you work from your guts." Oh yeah, the training at Tambaram was tough. Especially on the male candidates. The battalion gaped as this married-woman-with-a-kid climbed the fireman's ladder. She was unfazed. "I went prepared." But not enough, she thought, when she was given authority over the heaviest division in Tamil Nadu — 14 stations, 2 thermal power plants, Manali oil refinery, the industrial belt... a pyrotechnic-friendly section, if ever there was one. "Initially, I was under tremendous pressure," she admits. "I leaped into it and the fire chief, Mr. Dogra, gave me freedom, trusted me." That when the fire alarm rings, ma'am? Blood rushing, bell ringing, this knight in shining armour leads her all-male crew to the spot. Forming a cordon, she flags off Operation Fire Douse. Slum dwellers are the best behaved in a flare-up, she says, and in areas where slum fire is a seasonal ritual she can count on volunteers. In this fire-happening city there is no danger of boredom. 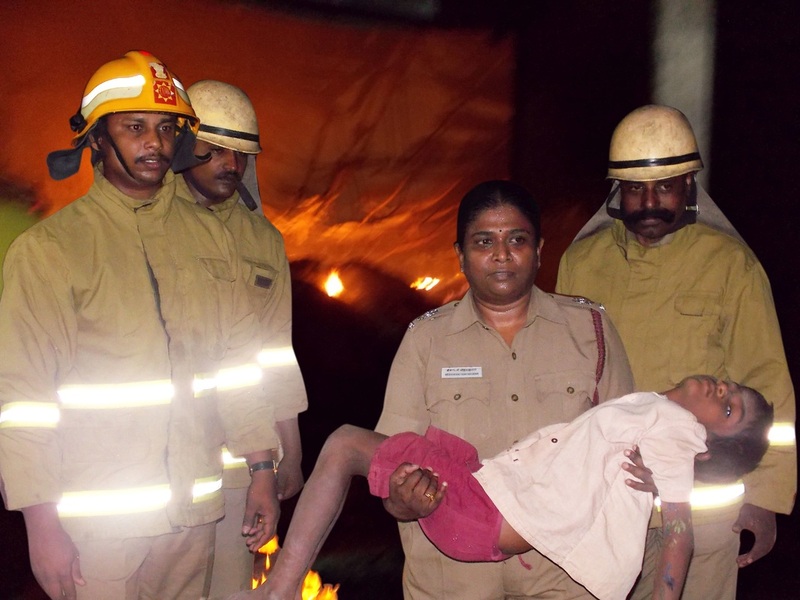 At the fourth floor garment godown fire in Athipattu, she and her crew watched a floor come crashing after them. In the middle of the night, she stood wondering how to breach the blaze in Spencer's Plaza. She watched in horror a woman running into the flames to save her TV set at Aspiran Garden. She dashed to Sreenivasapuram before the tsunami struck a second time and put in 18 hours of rescue and clearing of bodies. That episode had special effects. She met the CM, was praised for her work. "It was unforgettable." So was the Santhome building collapse where her crew was able to save a man. "I kept talking to him while we pulled him out of the rubble after five hours of digging." Danger, ma'am? "No big deal. Fighting fire is something we do every day, take it literally or otherwise. It's an extension of what we do at home. I only fight fires, you know, others manage horrible in-laws and husband!" When hubby's on out-of-town postings, neighbours and servants help. Fires happen almost always between midnight and early morning, and her young son has been alone in the house more times than she cares to remember. "I tell him what he has to do, (and what she has to do) and leave it to him to decide. Sometimes he misses me, but that's life. The worm has to break open the cocoon to become a butterfly." We'll hope her son doesn't read this. She has great promos to get women to join. "When people come out we go in," is one. "When we sleep, people are all right," is another. "Women bring that extra touch," she insists. "You take people into your fold, your motherly instinct comes to the fore." More advocacy and Tamil Nadu might have the first all-woman fire service. We'll say "Amen" to that. On men: More than your husband, you need someone who takes care of the house. Handling them is easy, just tell them, "No-nonsense!" On work: There is a difference when women do it. It's fantastic! On play: Always with family, we swim together. Few fire services in the world would have had to handle a situation like the one created by the Tsunami that hit the coastal areas of Tamil Nadu. Looking back at the event, while it leaves the mind disturbed with sights of terrible devastation and of vast areas strewn with dead bodies, it also gives some satisfaction that we were able to save more than 1500 persons. The Tsunami led to instantaneous death and only those who could be shifted immediately to the hospitals could be saved. After the first few minutes, our personnel had to perform the difficult task of retrieving dead bodies. This clean-up operation ensured that epidemics did not spread.